The story of David and Goliath was one that my grandmother would read to us often. She took care of her grandchildren on Sunday morning while mom and dad went to nine o’clock Mass at the cathedral in downtown Monterrey, Mexico. Dad bought us a book with stories from the Old and the New Testament adapted for children. The story of David and Goliath had a color picture of David with the rock in the sling facing the giant enemy soldier, standing in front of the small shepherd, mocking him because he wore neither armor nor sword. But this was not my favorite story because it scared me! Every time I heard it I felt in my heart the anguish of the people of Israel, listening to the taunts of an enemy, frozen and scared because no one felt able to face him and overcome him (see 1 Samuel 17). In February, President Obama announced that by the new law of the U.S. Department of Health and Human Services (HHS) it is required that Catholic organizations pay with their money for sterilization services, contraception or abortion inducing drugs. This mandate tramples the conscience of those who use their money to pay for these services and our bishops and leaders responded quickly and publicly to say NO! They have started a campaign of awareness, education, catechesis, civic action and prayer that seeks to stop the restrictions on our freedom of conscience. In short, we are telling our national leaders that we do not accept this mandate because, if we do, we compromise our faithfulness to what God has shown us is pleasing to Him. Those who follow closely the development of this story understand that we are getting ready to engage in a real struggle to determine who has more influence in the consciences of people: the Church of God and their representatives, or other groups and their friends in politics and government. For a better understanding of the situation please visit www.usccb.org/issues-and-action/religious-liberty/conscience-protection/ on freedom of conscience or https://www.usccb.org/issues-and-action/religious-liberty/fortnight-for-freedom/ on resources for education. You will find information from 53 dioceses. But what are the implications to the ministry of evangelization? Those who evangelize with the Kerygma or the proclamation of the Good News announce the victory of Christ over death and sin and the Church as the People of God living according to God’s plan to put everything at the feet of Jesus Christ our King. Gospel or Good News refers to a term that means the announcement that our King has triumphed and will continue to reign in our nation. Good news, right! Then we have to make connections with the times we live in, and announce in our historical context the call to put our faith in Jesus Christ and his victory while still looking to put everything under his feet. So far, so good. But we cannot ignore the mistakes of the past. We are called to help every Christian to discern their role in this situation where we face opponents of the Gospel of Life and the Culture of Love. To be faithful evangelizers, we pray and ask God to guide us and open our eyes to the present situation to announce the Good News –the victory- in context, and prepare God’s people to respond as the Holy Spirit inspires. In summary, we have to pray and study the situation to achieve victory without neglecting the original Christian attitudes that please God: service to all, especially the vulnerable, love of enemies, forgiveness of offenses and total dedication to imitate Christ, with whom the Father is well pleased. This may be our most basic commitment as evangelists, as our bishops and leaders continue to discern the present situation of our Church. Faithfulness to the whole Gospel can be a very tricky task. However, conventional wisdom tells us that history tends to repeat itself. As evangelists, we also review the history of our salvation and some of its important moments. Are we facing a situation where we are being asked to act in ways detrimental to our God-given dignity? Let us briefly review the errors of the People of God in the past: unfaithfulness to the covenant, shame of being different from other nations, alliances with nations in exchange for political and military protection, attention to false prophets, abuse of trust in the rituals and promises from God, and expecting a Messiah that would restore the political power of the past, and so on. These were mistakes because they did not represent the will of the Father. 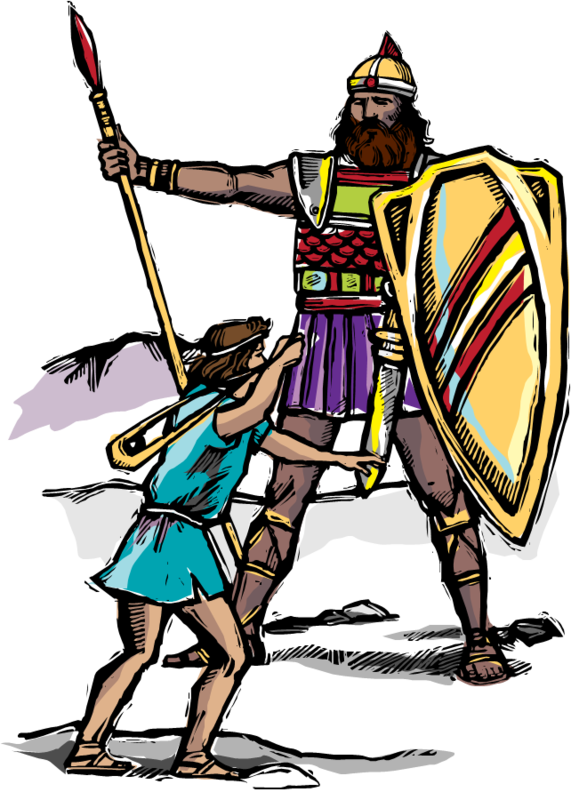 Returning to the story of David and Goliath, we may want a “David” to emerge and restore the historical past and fix everything. We may forget that Jesus Christ calls all his people, by baptism, and gives us the ability to act as He acted and stand up for the Gospel of Jesus Christ. In short, as evangelists, the worst situation is to think that this struggle is about regaining the good old “Davidic” times and annihilate everything new, or worse, to think there is no struggle, no People of God, and there are no opponents of the gospel, no struggle for freedom, and these are “just political situations”. These are extreme and dangerous points of view. Finally, I think that as evangelizers we can discover that, providentially, the present situation of the Catholic Church in our country is a blessing in disguise. In a few months leaders from around the world will meet at the Synod of the New Evangelization. Our Holy Father Benedict XVI has asked us to pray that the Church might be prepared to present the gospel convincingly to the new generations in their new contexts. The leaders from the United States will also participate and could describe the real situation at home. If the future of the Church is to live as in “the Promised Land” or if we are to experience “Exile” or “Invasion”, only God knows for certain. If the Gospel is at stake, let us pray and prepare for the most important battle, the one that no one can ignore, the battle for our heart! We battle so that our heart will always remain faithful to our Catholic identity, and be ready to give our lives for Christ and his authentic universal Gospel, to cooperate with Christ in his goal to gather everything and everyone to Himself. May the Holy Spirit reminds us all that Jesus taught us and put on our lips the words which will encourage our brothers and sisters to hold the true Kingdom of God in our nation, the kingdom that seeks the will of God the Father in good times and in bad times, under mockery or with applause. Long Live Christ the King!